The Artful Maven: Make-n-Take Madness! Happy Friday everyone crafty! 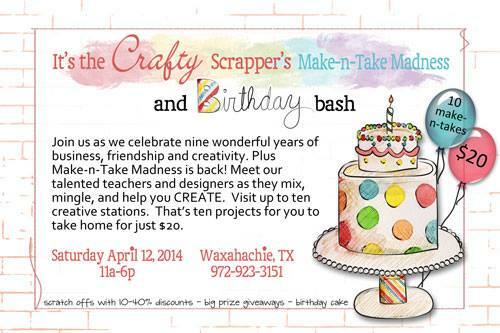 It's going to be a busy weekend for me, as I'm heading to The Crafty Scrapper to celebrate the store's 9th birthday! There are going to be prizes, food, Make-n-Takes, and all kinds of fun going on all Saturday! I'm doing one of the Make-n-Takes, a Handbag Notes & Collections Clipboard in grungy Tim Holtz style, and I thought I'd share it with you. If you are in the area, please stop by, say hi, and join the fun! Don't forget to leave a comment on my post "An Awesome New England Visit Part 2" to be eligible to win one of several give aways. Good morning, happy Friday! Have a wonderful time, everyone attending the celebrations will love your gorgeous make & take. This looks wonderful, hope you have loads of fun!! Awesome clipboard. I would love to be in the area. This would be so fun to make. Have a great busy weekend! Have fun Anita, the clipboard looks so fun!! I love your Handbag Notes in grungy style. It is amazing! Have a wonderful weekend!!! Very nice and what a great idea. Wow! Great project. Love it! What a great M&T project. Wish I could pop in and play along with you and Jim this weekend! Oh how I wish you weren't so far away. I would love to do a make and take with you. This is fabulous. I can't believe the cost either. When we are Lucy enough to get a visitor in Aus. We pay in the $100 region. Every cent well spent though, I am sure people don't realise how lucky they are over there though having such talented people like you on their doorstep. Hope you all have lots of fun. It sounds like it will be a lot of fun, especially since they'll be working on your fun project. Blessings! That's a gorgeous project. Hope you enjoyed the weekend. Wowsers! I love what you've done to this clipboard. I have a ton of these sitting around. Now I'm inspired to get them out and make something fabulous with one of them. You are sooooo creative. Wishing you a Happy Easter, my dear friend! Hugs! Sorry I missed the giveaway but I wanted to tell you I love your idea for the clipboard! This is gorgeous. Sounds like a cool event. Great to see what you had them all making... so wish I could have been there to play!